Tired Me/Rational Me: Niko’s crying, and it’s 3am; he must be hungry. Rational Me: Get up and feed the baby. Tired Me: I already fed the baby! 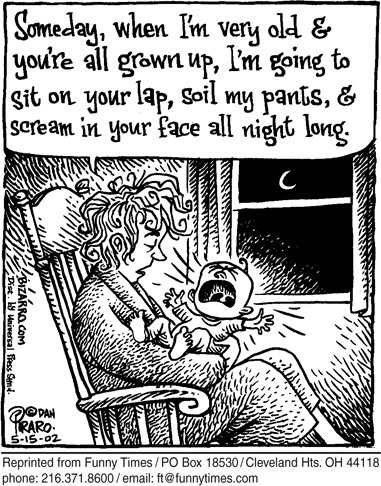 Rational Me: The baby is crying; get up and feed the baby. Rational Me: No, you did not feed the baby yet, otherwise he would not be crying! Tired Me: Yes, I fed him, and I’m going back to sleep! … But why is he still crying? Tired Me/Rational Me: Oh, the baby is crying which means he has not eaten and must be hungry. I have to get up and feed him. Am I having an argument with myself in my head? This would make for an interesting blog entry. After this little ditty with myself, I proceeded to get out of bed and tend to the needs of my hungry baby. Lucky for Niko the rational side won out. Although, I am sure if his crying would have persisted this would have snapped me out of my reverie like state, a state in which it seemed perfectly normal to be arguing with myself ! In conclusion, I think arguing with oneself at 3am is a sign of someone who might just be a touch overtired! That said, I took the advice of many today, and napped when Niko napped and really didn’t get out bed for good, until 11am: oh, sweet, sweet sleep! 8 Responses to "Tired Much?" I remember when breastfeeding Malcolm I used to dream I was feeding him – wake up and feed him – fall asleep and dream about feeding him. I couldn’t tell dream from reality – it was brutal. The second baby I got so good at feeding I barely woke up while doing it even though her room is down the hall! i too agree with all these comments and have to say sometimes my only saving grace was that i would think ‘there have to be countless other mom’s in brantford doing this very thing every 2 hours tonight’! … and then i would look out my window onto the street and see NOT a single light on ! with baby 1 i used to sleepwalk to her bedroom to feed her and doze and kink my neck in the rocking chair and then burp her. with baby 2 i decided to bring her into bed with me but was consciously nursing and then placed her back in the crib as i burped her and with baby 3 i just let him be part of the ‘family’ bed and was unconsciously aware at times thru the night of a feeding baby … but never fully awakened! moms just know how to make the most of their sleep or lack of it and they do what is necessary at that time.